If you’re like me, you write a full draft and then hide it away so you don’t have to think about the process of rewriting and editing. All those words… and they’re… so… bad. The trouble is, rewriting is where the real writing takes place. You didn’t think that first draft was writing, did you? Oh, no. No, that’s not how it works. Damn. 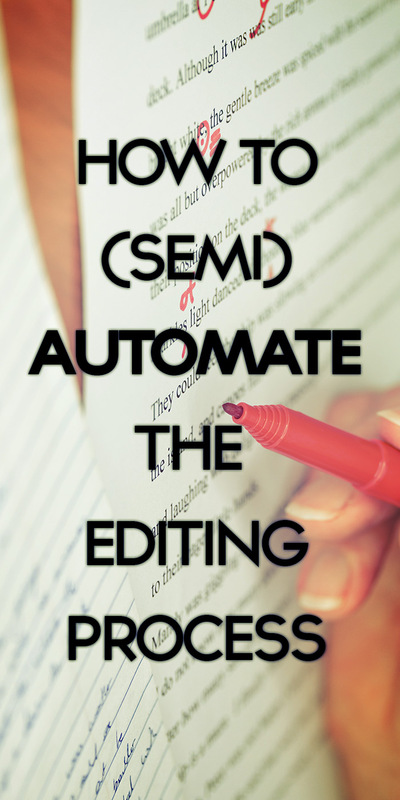 The good news is there’s a way to, at least initially, add some speed to the editing, which leads to better writing which makes for easier editing and re-editing. It’s this big circle of writing and editing and writing and editing and it’s super awesome. Unless you’re like me and you just hate it and it’s not super awesome, but merely tolerable because it produces and end product to be proud of. So here’s what I do… I start my editing of a complete first draft in small automated chunks that incrementally improve the copy before I get into substantive rewriting. Since I write for a living I tend to do this for a couple of hours at a time, but you can break these down step by step and do just a little a day—five or ten minutes even. The more you do, the better the writing will be when you get into the real rewriting. Here’s what to do. Very. Hit Cmd+F in Microsoft Word (Ctrl+F on a PC) and bring up the find dialogue (you might have to do Shift+Ctrl+H to get the real dialogue instead of the menu search box, alternatively you can select “Advanced Find and Replace or Replace from the Edit menu). In the Find box type the word “very” and make sure “Find whole words only” is checked. Click the “replace” tab at the top, but leave the replace box blank. On my Mac, it looks like this. So, very? Why are we searching for that? It’s a common word that creeps into writing and, unfortunately, it’s a sucky word. Mark Twain once advised that for every instance of “very,” replace it with “damn” and you’ll see why. It’s an adverb, and while it seems like it’s useful when you’re typing it out, it probably does nothing but weaken the sentence it’s in. Click Find Next to find them, and then hit Replace to delete it. Here’s the key to making this technique work: delete at least 90 percent of them. If you’re real brave, you can kill all of them. Resist the temptation to hit Replace All, you really need to spend a few minutes looking at what you’ve written and how cutting “very” improves your writing. That way, you’ll be less likely to write the next time around. Totally. Same as very… pop it in the replace box and cut it. Remember the 90 percent rule? That means 9 out of every 10 instances should go. Really. Just another variation on totally, and very. Cut, cut, cut. -ly. Now the process is going to take a little more work on your part. 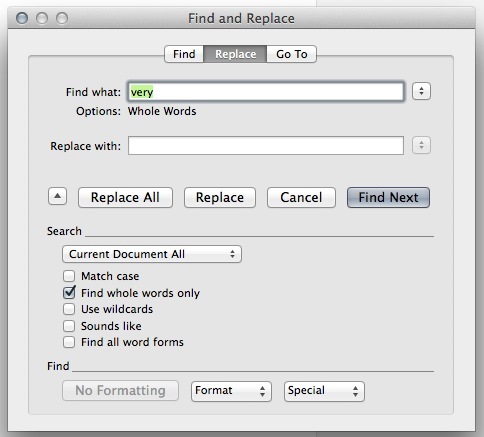 Uncheck “Find whole words” and type “ly” into the find box. Leave replace empty. What we’re looking for here are more adverbs. Lucky for us, many of them end with “ly.” When we find them, we usually want to cut them. If doing so changes the meaning of your sentence, choose a stronger more specific verb instead. Rewrite, click find again and move on. The biggest surprise here is going to be how many adverbs have snuck in—if you’re anything like me there’s going to be a billion or two in that first draft. Here’s a resource on how to fix the adverb problems your search finds, and a list of nearly 4,000 adverbs that you should avoid like calories laced with trans fat. As and -ing. These ones are going to take some work, too. You can’t just cut them, you’re going to have to do some real rewriting. Set up is the same, just pop “as” into the box, and then, when you’re done, “ing.” You’re looking for sentence constructions joined by as that should really be separated or sentences built around an “ing” verb—especially at the beginning. Here’s why as and -ing kill your story and how to fix them. Whew. Did you stick with me through all that? If you take this steps, either all at once or in a few five to ten minute sessions, your writing is already worlds above the never-have and never-will-be published writers toiling. There are a lot of those, and you’ve just risen right above them. Seriously- most novices never edit these things out, even after extensive writing. And the goal here really isn’t to automate anything except finding the problems, you still need to do the work of fixing them. Why this method works so well, though, is because you’re editing in passes—focusing on one thing to fix at a time. When you get down to actual substantive writing, you’ll have a very clean manuscript to work with. Feels a little less daunting already, right?